Yesterday was one of those days when I wish I was two people, or that I could be two places at one time. 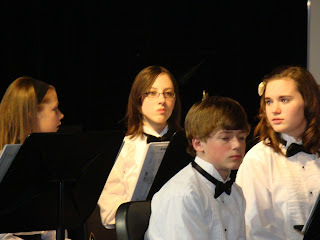 Hayley had an honor band concert and Paul had a track meet (at my alma mater!). I chose to go to the band concert because Hayley needed me to drive her there and I wouldn't have returned from seeing Paul run in his races if I had gone to the track meet. Here is Hayley. She looks very serious. The honor band did a wonderful job as usual. In two weeks her regular 7th grade band will have their spring concert. She'll play bassoon (or balloon or buffoon) in concert for the first time! However, I can say more about the trip. But not much more. We stopped at Art and Karen's house for dinner on Sunday night. Karen heard we were going to be out in UT and the minute she heard, she texted Katie asked when we were available to come over. She sure makes a person, even a related-through-marriage person and mother-of-the-person-related-through-marraige person, feel welcome. We had good conversation over dinner and after dinner. And Karen took this picture. I'm still suffering from vacation brain. My grocery trip yesterday was only partially successful as in I purchased food for yesterday's dinner. However, I have not even considered what I was going to fix for the rest of the week. And the only reason I thought about dinner yesterday was because I had to make a dinner for another family. So I am going to resort to seeing what there is in the pantry (aka sewing room) and make something up. I went out to Utah for several days and hardly took any pictures! On the day I wanted to take pictures, I forgot the camera. 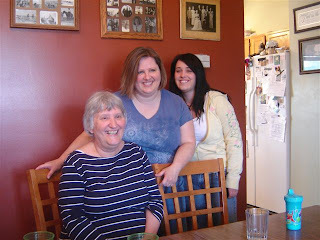 That was the day Mom and I went downtown with Katie. The flowers on Temple Square were gorgeous and I could have spent hours taking pictures of them--so you are spared looking at that. I did take a couple of Katie in her kitchen. 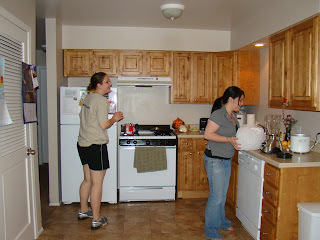 Here is one:The other girl in the picture is Katie's roommate, Julia. Katie made smoothies for us. We went to Deseret Industries (DI) twice. Mom has a thing for thrift stores and wanted to check out the Utah version. She was impressed. We got Katie a lamp and end table because Katie's living room has no overhead light and she likes to cross-stitch while watching TV at night. She needed light. The whole ensemble cost $17. This is the view out Katie's dining room window. The library is across the street. Hayley now has braces on her top teeth! She'll be getting braces on the bottom in a few months when her top teeth have moved a little. I don't know all the whys and wherefores of putting the bottom ones on later, but it has something to do with her bite. She was excited to get them on finally. 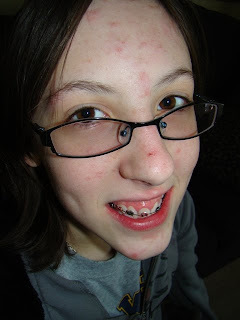 She's been asking for braces since Paul got his on. She did miss the state assessment testing that is going on at the school, but HONESTLY, when I made the appointment several MONTHS ago, mandatory state testing wasn't even on my mind. I did not think to consider, "When will Hayley be taking the MCAs? Perhaps I should schedule around them." I'm not a fan of assessment testing anyway. Does the child do well in school generally? Yes. Then she's fine. Jen, want to chime in on state assessments--real reason for and what does it measure exactly? While I know it's a very trivial subject, I feel I have strayed from one of the purposes of this blog, which was to publicly adore shoes. I just bought some sandals yesterday. 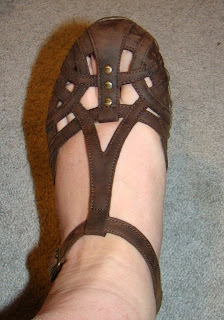 I haven't had sandals in a few years and I wanted something that would be airy during those hot 'n humid days. These were waiting for me at Kohl's. They called my name, "Oh, Shoebox Princess! We know you're here! Come get us! We are sandals in need of feet to hug! You haven't bought new shoes in nearly a year! It's time! Get out your money and buy some sweet sweet love for your tootsies!" Paul ran a 4:49 in the 1600m! That's his new personal record, and it's only one measly second off the sophomore record for his track team. He is pretty pleased with himself. He was just a wee smidge behind their team's #1 runner. I am sad that I was not able to go. But I was glad that Jim was there to see it. And I was glad to hear that Paul asked his dad to call me and tell me right away. There are no pictures from the race because Jim forgot to take the camera. He really needs a little point-and-shoot one to keep in his briefcase. I'm in project mode. It started with my newest class. I have an assignment to reflect in writing on my letter-writing experiences. I'm supposed to quote from some of my letters. In order to avoid doing what I'm supposed to but still make myself think that I'm doing it, I chose to get out old letters that people have sent to me and organize them into piles. Pile #1 is in a dark blue binder. These are letters from my sister Jenni. They are in order, but will be added to once I get through all the letters. But for now, they comprise letters from 1993, 1994, 1995, 1996, and 1997. And even one or two from 1989. Pile #2 is made up from letters from my mother. #3 is a grouping of letters from Jim's family: his dad, his mom, his grandma Wright, and his sisters. #4 is a slew of letters from my college and high school friends (only one of them wrote me after 1990, and even so, I haven't heard from her in 10 years) and from my grandparents. Track again. This meet was called the Pony Relays, but inexplicably, not a single pony was involved! Even MORE inexplicable were some of the events: the Shot Put relay, the triple jump relay, the pole vault relay, and the discus relay. I'd like to see the shot putters run around a track with a shot put and passing it on to the next guy. 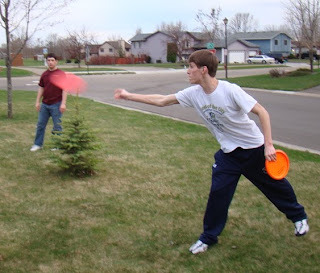 And how do you do a discus relay--throw the discus to the next guy and expect him to catch it? Pole vaulting--do you run with your pole and stab the next guy in the back? har har har. Paul tried to explain it to me but he's no good at explanations. "See they don't really run. They um they um throw and then add everything up. Yeah." Guess what season it is? That's right, it's Taking Pictures of Paul Running season again. Yesterday afternoon, the boys' track team had a home meet so I was able to go without having to drive miles and miles and miles. He got some new track spikes because he outgrew his old ones. He chose green and gold. And his weren't the most outrageously colored track shoes on the asphalt either. I saw a pair of neon orange spikes on some otherwise normal-looking teenage boy's feet. 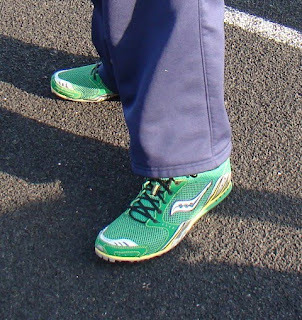 It seems to me that track shoes are the one type of men's footwear that comes in loud colors. And he's off.And he finishes! Out of extreme boredom (both mine and Fake Child's) I was helping FC sound out words in the book Stop That Ball. (I love that book because my CA grandparents had it at their house in Simi Valley and I loved to look at the ball and follow its misadventures through the little town). Anyway, I told FC to pick a word on the first page to sound out. She pointed to one; I was sitting across the room from her (my laziness extends far and wide) so I couldn't see which word she had picked out. Other Jim was at the kitchen counter eating some leftover spaghetti. FC mumbled the sounds to herself and then she looked at me. I asked her if she was able to sound the word out, and she nodded her head. "OK," I asked. "What does it say?" I took Hayley to Target yesterday to buy her a new swimming suit and a watch. In the jewelry department, we sought out the watches and as we went down the first aisle of watches, she looked at the offerings and said, "I don't want a NICE watch." You want a not-nice watch? An ugly watch? A used, dirty, slimy, icky watch? I had a good laugh at her expense after telling her that Target probably doesn't sell watches that are the opposite of "nice," and she joined in with a few giggles, after she realized that she had not adequately communicated what she was thinking. What she meant was that she didn't want a shiny gold or silver watch that looked like it was "for show" or "looked like it was also doubling as jewelry." She wanted a timepiece with a cheap plastic and velcro watchband. Yes, a not-nice watch. I blog surf, as I've mentioned before, and the type of blogs I come across in the blogging moms universe more often than not promote the idea that life should be enjoyed EVERY MINUTE OF THE DAY!!! These blogs are mostly written by mothers with small children. I found a fun new website to keep up with (I'd been looking for something since Stephanie O'Dea finished her 365 days of using a slow cooker). This woman has made a year-long commitment to shop for clothes only at flea markets and garage sales. 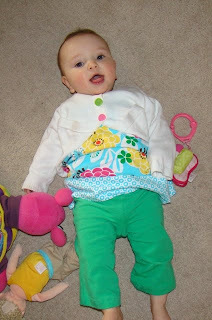 She has given herself a budget of $1 a day and she will repurpose, alter, dye or restyle an old garment into something new. Read about her mission here (New Dress A Day). Some of the dresses she finds are truly hideous, but she manages to look good in her refurbishments (it helps that she's wicked skinny). I'd love to try this too, but question my ability to commit to a year-long mission such as this. It would be fun to try something like this, though. And these two are because I like Spring. This post is for Katie, who I believe is trying to send Jim and me to an early grave by sending us miserably hard puzzles. Actually this one was easier than the M & M puzzle, but not by much. 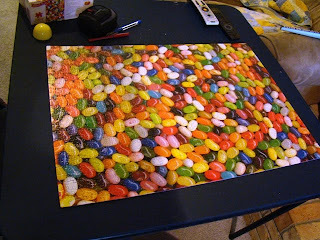 The jellybeans were larger, so much so that it took 3-6 puzzle pieces to make one jellybean. The other puzzle had 3-4 M & Ms on each puzzle piece. Warning for Katie (and anyone else) Do not send us a puzzle of the Beatles' White Album. If you disobey, then no more care packages from me ever! He went in for his ortho appointment and the orthodontist informed Paul that he has no wisdom teeth and will never have them. Poor Paul! He won't have the pleasure of being loopy without realizing it, and trying to prove he's a manly guy by going to work/school the same day as his extraction (like OJ did, or in the case of school, TRIED to do but I wouldn't let him). And Jim and I lose the opportunity of emptying our wallets as an offering to Maxillarius and Mandibularus, the gods of supernumary teeth (two of the lesser gods in the pantheon of mighty beings who rule over life with teenagers). Alas. The good news is that the braces are doing the job and will be on only for another nine months. Mike shows me a new pair of pants. Jake made great food. Poached eggs on hash was the main feature. Some boys get ready to dig in. But Vi prefers apron strings. Owen had fun with a new toy he found. And the egg hunt is on! Annie finds one to add to her already full bucket. This little thing rolled over to my house yesterday (Friday). She is such a dolly. I gave her Cheerios, which I hear from her mother (who tagged along) is a first. Vi didn't know what to make of the Cheerios. She gummed a few and gagged on a few. I took better pics with Jen's camera, especially the shot of Vi with a Cheerio mole. Jen gets down to business with the craft she was in charge of bringing: beribboned eggs. We both burned ourselves on the hot glue gun. Wah for us! 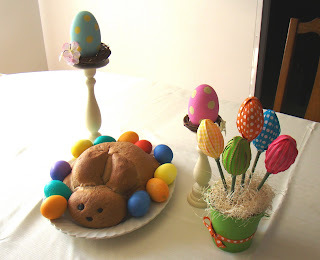 This is what my ribbon egg turned out likeKind of tulip-bulb-y. Jen is very proud of her craftiness. Good Friday? How about AWESOME Friday?